The Pacific Northwest is host to numerous species of wood boring beetles. The majority of these pests are more of a primary concern to agricultural or forestry interests rather than to the homeowner. However, some species greatly impact existing structures and should be addressed when infestation or damage is found. Wood borers go through a complete metamorphosis during their life cycle (egg, larva, pupa, adult). With most wood borers (except for ambrosia beetles, which do not infest seasoned wood), damage is caused by the larva. *Note: Some academic literature now classify Lyctids as a subfamily of Bostrichids (see below). This subfamily is known as Lyctinae. Corrective measures: Depending upon extent of infestation, it may require removal of the infested material, sealing uninfested wood, or having a professional perform topical borate treatments or fumigation to arrest the problem. Bostrichids: Generally infest only hardwoods, with a few exceptions. Prefer infesting standing timber, so infestation in structures is rare; most instances occur in newly constructed buildings where lumber was already infested. Once the adults emerge (one to five years, depending on species), they do not reinfest but move on to live trees. Examples include the large (1/2-7/8") black polycaon (Polycaon stouti), the lead cable borer (Scobicia declivis), and the bamboo borer (Dinoderus minutus) that can infest imported wood items. Corrective measures: In a structure, once the adult has emerged no additional corrective measures are generally necessary since they tend not to reinfest seasoned wood. Regarding the bamboo borer, small items can be placed in plastic bags and put in a freezer (at least 0º F. or colder) for several days to kill the larva causing damage. Cerambycids: Longhorned wood borers and round headed wood borers are included in this family. Species of this family that reside in the Northwest generally infest only standing timber or green lumber. The one general exception in the United States, the old house borer, even though a single beetle was detected in The Dalles in 2013, is not known to be established in the Pacific Northwest at this time. Additional information on the old house borer can be found by clicking here. Corrective measures: Generally not required as these will not reinfest seasoned wood. Buprestids: Examples of insects include short-headed wood borers, metallic wood borers, shot-hole borers, and the western cedar borer. These beetles infest softwoods, generally timber with bark on it that has been lightning struck, recently felled, or that is standing in fire swept areas. They generally do not reinfest seasoned wood. One of the most commonly identified buprestids in the Pacific Northwest is the Golden Buprestid (Buprestis aurulenta), easily spotted by the metallic green color of their wing cases. Though they infest only unseasoned wood as noted above, infested wood that has been milled and put into service has had adult Golden Buprestids emerge as late as 50 or more years after construction. When the timber is milled, it appears that the lack of fresh nutrients in the wood or other factors dramatically lengthens the larva’s life cycle. Generally it is not possible to detect infestation of these beetles until they emerge as adults (they leave an oval shaped exit hole up to ½ inch in size). Once they emerge, they seek out green timber so no corrective measures are required to protect a structure from reinfestation. Anobiid beetles: Wood borers in this beetle family infest hardwood and softwood, green and seasoned wood. The anobiid of greatest structural economic importance in the Pacific Northwest is the Pacific powder-post beetle (Hemicoelus gibbicollis), also known as the California deathwatch beetle. Most common occurrences of infestation are in substructures with moisture problems. 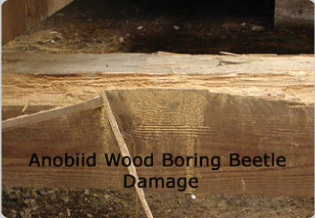 Anobiids need a moisture content in the wood of at 15% by weight to survive adequately. Wood substructures with unheated crawl spaces coupled with damp exposed grades or seasonal standing water are at greatest risk of infestation. Once established, the adults will emerge from infested wood and lay eggs in the same or adjacent wood members, thus renewing the life cycle. Anobiids leave exit holes that are round in shape, averaging 1/16-1/8" in size. The larva can spend one to three years burrowing in and consuming the wood before they pupate, leaving behind frass consisting of bun shaped pellets and loosely packed fine powder. Corrective measures: The moisture content of the environment where the infestation exists must be reduced to obtain control. Similar to reducing the risk of wood destroying fungi infection, vapor barriers, removal of standing water in a crawl space, and adequate ventilation are mandatory. Infested wood should be removed and replaced. 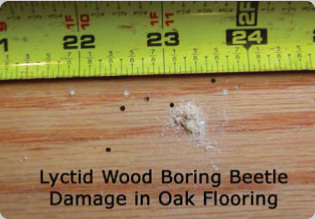 Treatment of the undamaged wood and adjacent areas with a borate product by a licensed pest control operator can effectively ‘poison’ the wood and kill larva trying to consume it. In extreme cases, it may be necessary to consider space fumigation of the structure to eradicate a widespread infestation. Additional academic information on wood boring beetles in the Pacific Northwest can be consulted by clicking here.